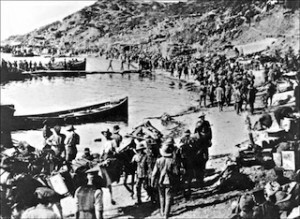 AS thousands of Australians and New Zealanders descend on Turkey’s Gallipoli Peninsula for Anzac Day, and millions at home and abroad honour the importance of the day, most likely few will give thought to two Australians whose quietly-played roles were so important in having April the 25th recognized as it is today. One was a war correspondent, Charles Bean, and the other a photographer, Hubert Wilkins who was ultimately knighted for his deeds as a trailblazing aviator, cinematographer and war hero. Bean had been commissioned by the government at the outset of WWI to write an official history through the eyes of those Australians who fought on eventual battlefields from the Middle East to the Western Front and in Gallipoli. 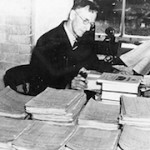 In the latter he had put himself into the frontline and quickly earned recognition for his first-hand reporting on the bravery of the Australian and New Zealand ‘Diggers’ – and while wounded himself at one stage, his writings were credited as a major influence in creating the legend of the Anzacs. Thus it was fitting that Bean should have been appointed in 1919 to lead an Australian Historical Mission whose role was to attempt “to solve the riddles of Anzac,” and to collect material for a national war museum Bean proposed, and which would ultimately become today’s Australian War Memorial. Bean already had his own diaries that he’d diligently written up every night on the battlefield, and as well had also collected trunks-full of relics – personal items discarded by Australian soldiers on the various war fronts and which, to Bean, provided a human side to the conflict. 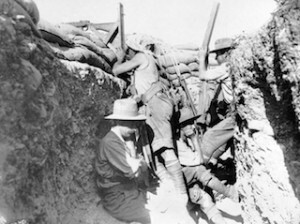 However because of the hurried nature of the retreat from Gallipoli, he had been unable to gather any relics there; the Australian Historical Mission would allow him to do so before they were lost to the weather – or souvenir hunters. He also wanted to view the battlefields from the Turkish side, giving his mission a balanced perspective. Amongst his 8-member team, Bean chose photographer and war hero Hubert Wilkins rather than the AIF’s other official photographer Frank Hurley… whose habit of superimposing two or three different images to achieve more dramatic pictures, Bean was disdainful of. 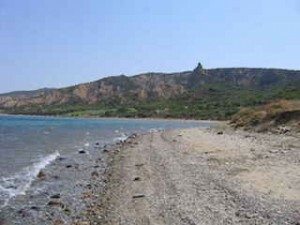 “Wilkins sought to provide our future historians with a record of places and events so accurate that they could be, and often were, relied on as historical evidence,” Bean explained, and also included in the Mission the war artist George Lambert to further capture the quintessential Gallipoli. Bean knew he had chosen well as the team scrambled over the rough terrain, at one stage attributing much of its success to the enthusiasm and spirit of Wilkins – once described by General Sir John Monash as “Australia’s answer to Lawrence of Arabia”. Today, modern-day tour guides still take visiting Australians largely in the footsteps of Bean, Wilkins and their team across Gallipoli. And at Lone Pine they pause in front of the Memorial Wall where the names of more than 4,900 Australian and New Zealand servicemen whose bodies were never found or identified are inscribed. Or admit to shivering at the cemetery at Lone Pine that lays atop a broad “No Man’s Land” where during a bloody five day battle, 2273 Anzacs and more than 4000 Turks were killed. 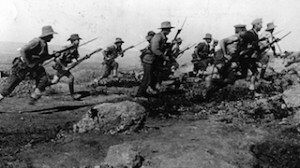 One of the earliest to make the now-famous annual Anzac Day pilgrimages was Australian Prime Minister Stanley Bruce, who fought (with the British Army) and was wounded at Gallipoli, and went back in 1924. The remains of the WWI trenches can still be seen everywhere today. 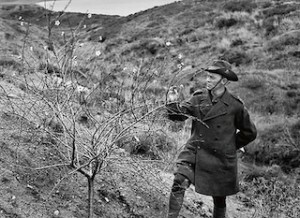 In some places they are less than 10m apart… on Christmas Day 1915 temporary “cease fires” were called between some trenches and the bitter enemies tossed cigarettes and food to each other – before resuming with bullets next day. 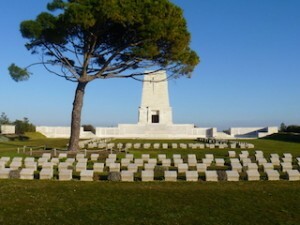 Travel agents have details of organized tours to Gallipoli for next year’s 100th anniversary of Anzac Day.